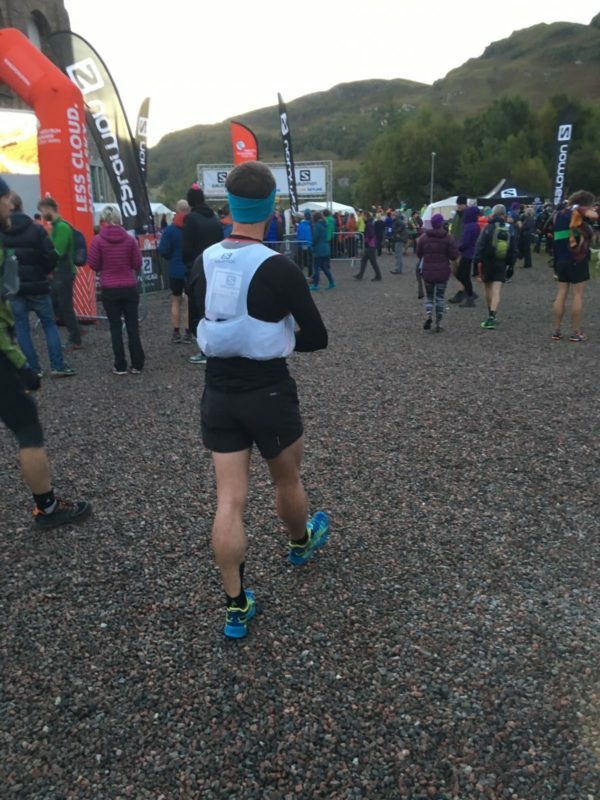 Last weekend Cicerone's Joe Williams ran the Glencoe Skyline race in Scotland. 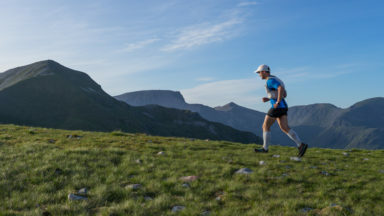 The race is regarded as one of the most technically difficult ultramarathons in the world, with scrambling up to Grade 3 standard, 55km to cover and 4750m of climbing. 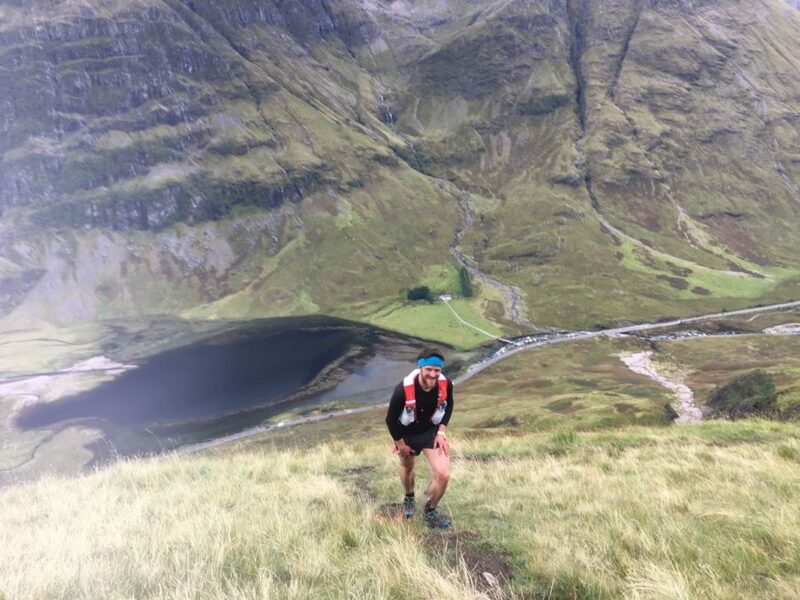 Five days on from running the Glencoe Skyline, and it’s hard to pick out any specific memories. When I close my eyes to picture it I see only grey, brown and green. And when I try to think about how it felt, I just remember feeling tired. Perhaps this was because – for the first time ever – I didn’t wear a watch during the race. Everything blended into a blur of rock, grass and mud. My legs felt pretty good at this point… 10 minutes before the start of the race! The speed was vicious from the start. All the hills were run, no matter how steep. 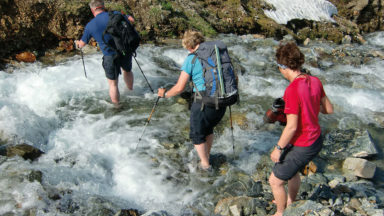 Some runners switched to hands-on-knees power hiking, but still maintained the pace. 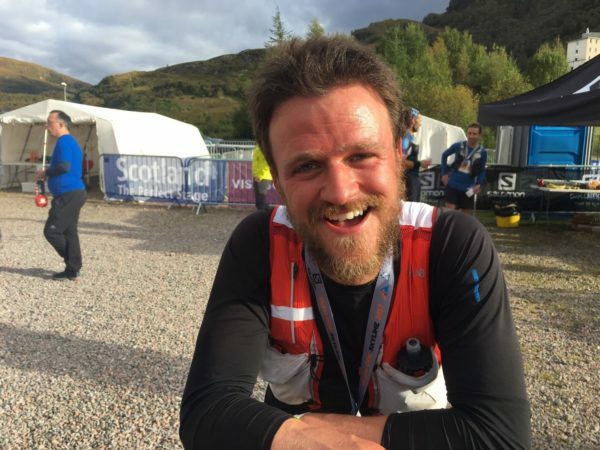 It felt more like half-marathon pace, and runners flew past me on the simple first 10km along the West Highland Way. I felt slow and inadequate, but knew that I had to keep the effort levels comfortable, otherwise I’d pay the price for it later in the race. 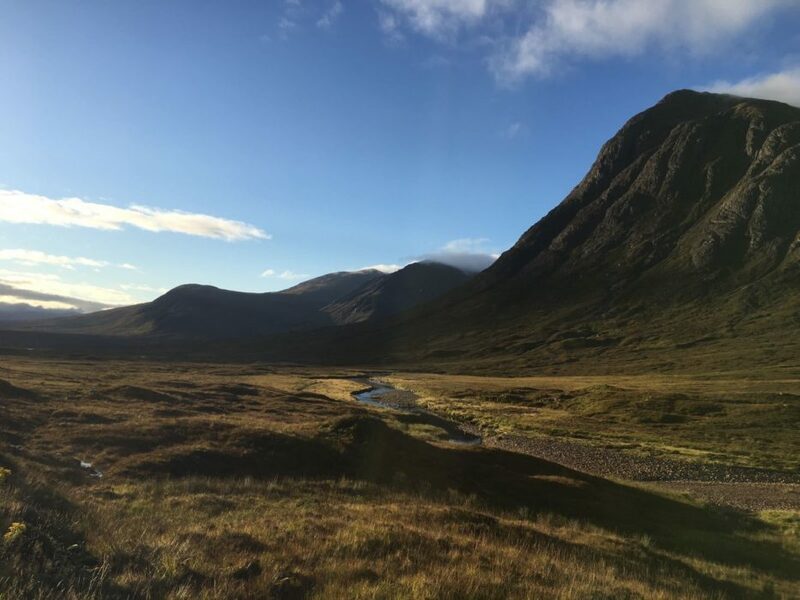 After over 20 years of looking at this peak at the entrance to Glen Coe, I finally was climbing it. Curved Ridge (Grade 3) loomed above and I could see runners strung out all along the steep and narrow pillar of rock. The scrambling was easy – all the holds were there, right when you wanted them. I was stuck in a traffic jam for a few minutes (a less competent runner above, holding us up), but I tried not to let this bother me. This always happens to me. 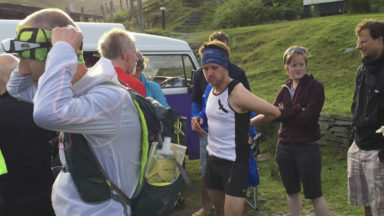 The middle section of any ultra race always seems to be a struggle for me. I gained some places and lost some places. I wasn’t enjoying it most of the time. It felt too fast. I didn’t like being in a race – it felt stupid and pointless. I thought about quitting for a second, not because I couldn’t do it, but because I didn’t want to do it. 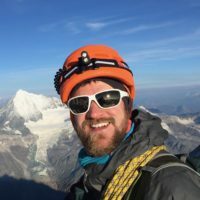 At this point, I decided to buck my ideas up: I had been wanting to do this race for years, it suited my strengths perfectly and Caroline was up on the next climb waiting to cheer me on. I briefly thought about how I would feel the next day if I quit. There was really no good reason to stop. So I pushed a bit faster to catch up to a couple of Scots and engaged them in conversation. It made me go a bit faster than I wanted, but chatting helped the miles pass faster. 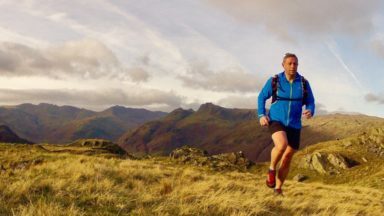 Soon I was overtaking these runners on the 1000m descent to the one and only aid station on the route, feeling strong, happy and ready for the business end of the race. 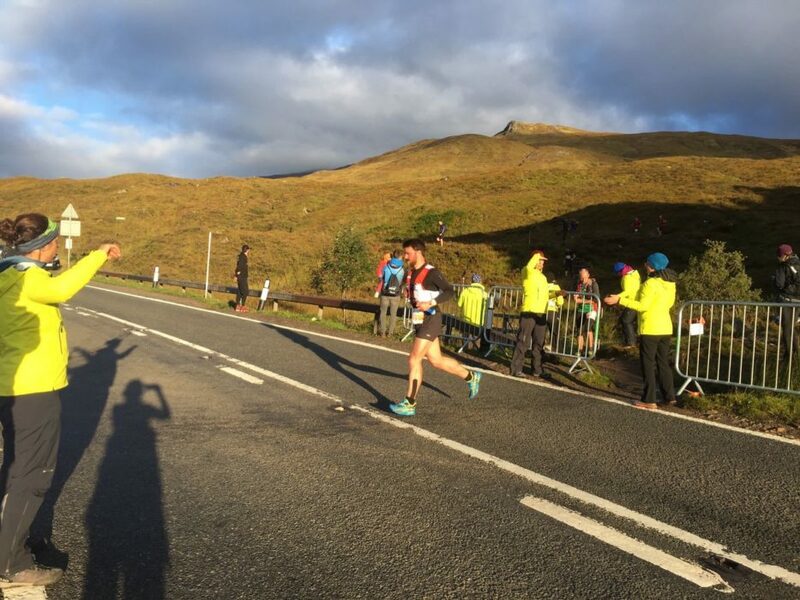 Quite unusually for a race that could take 6-13 hours to complete, Glencoe Skyline only has one aid station. I had planned accordingly, making sure I had enough food to get me round the whole route, all tucked away in my pack. Ordinarily, I would plan on drinking about 500ml of water, and eating about 250kcal per hour. 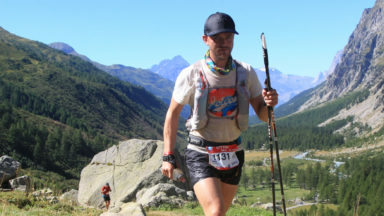 With the speed of the race being much faster than that of a run like the Bob Graham Round, or UTMB, I knew my stomach wouldn’t be able to handle lots of ‘real’ food, so I planned on drinking one 500ml bottle of carbohydrate drink each hour (powders stored in mini ziplock bags), supplemented by two mini flapjack bites per hour. For the last section, there would be no ability to refill bottles from streams, so I switched to water and 2-3 energy gels per hour. That was the plan and that’s what I ended up doing – exactly! So when I got to the aid station, there wasn’t much for me to do. 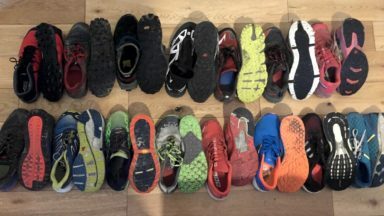 A volunteer very kindly filled my bottles for me (all the organisation and volunteers were so kind and helpful at this race), while I downed a cup of coke, a cup of water, and emptied the stones from my shoes. 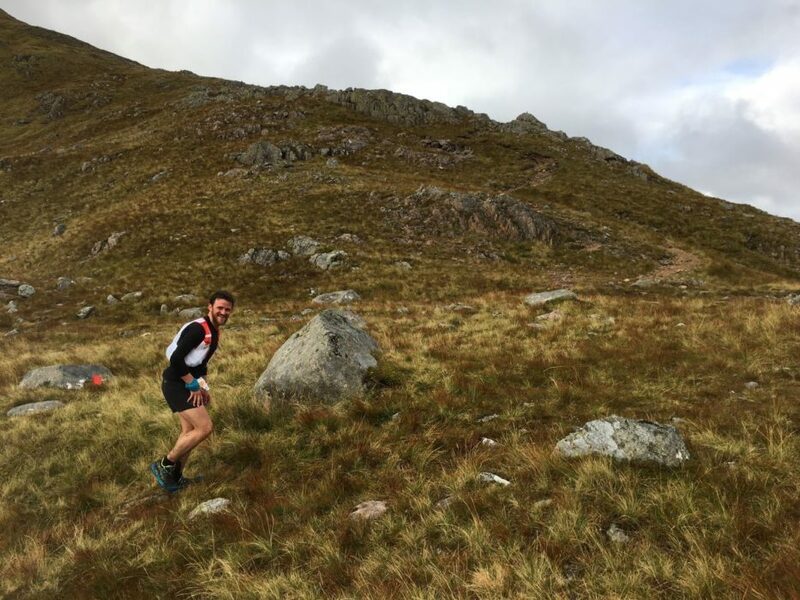 I grabbed a handful of crisps and ran out of the aid station, psyched up for the last big climb and the Aonach Eagach ridge. Tromping up the climb, I went into hunting mode: over the next couple of hours I passed 20 runners. I knew that halfway up the climb I would be seeing Caroline and that that would give me a boost of energy. Sure enough, it did, and I kept on digging in for the rest of the 900m climb. I was actually starting to enjoy myself at this point, and the exposed scrambling of the ridge got me excited. I overtook some people, and played cat and mouse with some others. Onto the final more runnable hills, I tried to push as hard as I could but I just didn’t seem to have access to another gear. 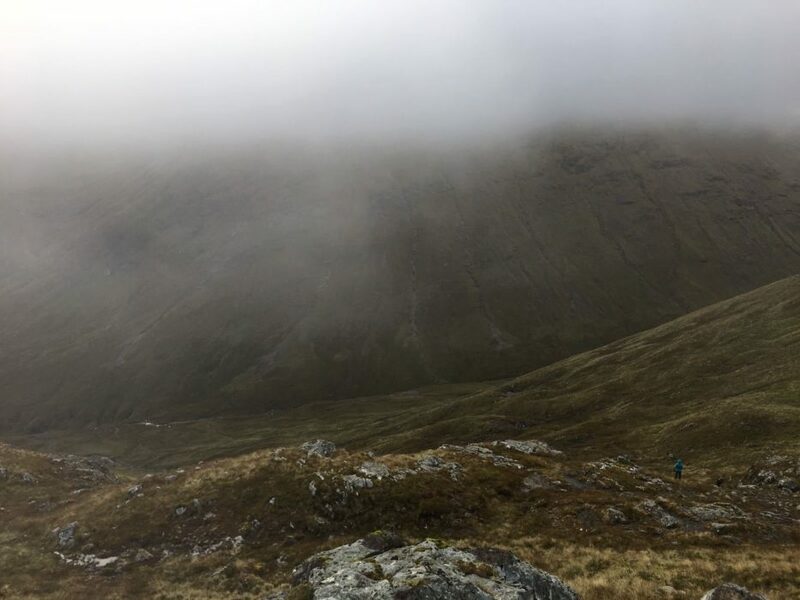 The descent was tussucky, boggy, steep and occasionally rocky, before it hit the final 6km of easy trail on the West Highland Way again. I ran faster, knowing it would be only half an hour to the end, but I seemed to lack the killer instinct to catch the runner in front. In fact, I got caught by two guys, but didn’t even try to hang onto them. The last few hundred metres, I stretched my legs out and went as fast as I could, rounding the final corner and then crossing the line. I put my hands on my knees and then – in something that is fast becoming a totally involuntary habit – I lay down flat on my back for a minute. When I opened my eyes there was a TV camera in my face! Ah well. I hauled myself to my feet and walked over to the barrier to give Caroline a big, sweaty, smelly, muddy hug.